It’s out! You can now download and install macOS 10.13 High Sierra final version for your Mac. Here are the details. As promised during the recent iPhone media event, Apple has now made the final version of macOS 10.13 High Sierra available for mass consumption. The immediate release means that all Mac owners with compatible hardware can now upgrade to 10.13 High Sierra right now through the Mac App Store free of charge. Apple initially took an opportunity to whet the appetite of Mac owners by introducing macOS 10.13 High Sierra in the first instance during this year’s Worldwide Developers Conference back in June. That initial reveal was then followed up by what seemed like a continuous series of pre-release seeds – including a GM release almost two weeks ago – designed to get developers and testers putting the platform through its paces to ensure that it made it to this day without any staggering bugs or issues. As with the company’s other software offerings, it seems that the plan has worked. On the surface of things, this may seem like a simple update which doesn’t actually change much, but when you start looking into the features and improvements you instantly get an understanding that that simply isn’t the case at all. Apple appears to have really taken a step back and thought about what users want to see with macOS 10.13, and have come up with a platform which deeply integrates machine learning, which focuses on tangible improvements for the end-user, and which will appeal to all of those with a compatible Mac. Some of the major new improvements with High Sierra include a more powerful and updated Safari browser offering detection of videos in websites and preventing auto-playing, as well as deep machine learning in apps like Photos with advanced editing tools. Those features are joined by iCloud file sharing, Live Photos within FaceTime, and a stunning new natural sounding Siri. Apple has also moved macOS 10.13 High Sierra across from HFS to APFS – and the change in file system on the Macs installing it happen all seamlessly without the users having to do anything on their end. All-in-all, a solid update offering compatibility with a decent array of Mac hardware, and available for you to download and install right now. 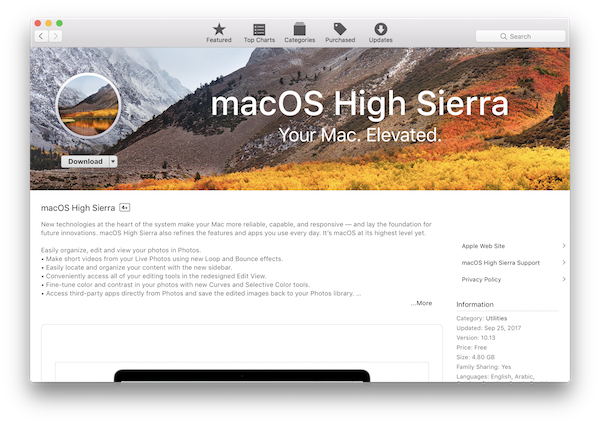 macOS 10.3 High Sierra is available as a free-of-charge download from the Mac App Store right now. Once downloaded from under Updates tab in the Mac App Store or by directly searching for it in the store, simply hit the install button to begin installing from there and allow the update to go through its process. 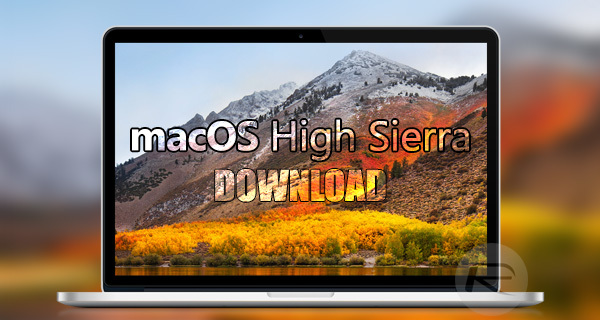 Update: You can now follow this guide to clean install High Sierra on your Mac: How To Clean Install macOS High Sierra 10.13 On Mac [Tutorial].